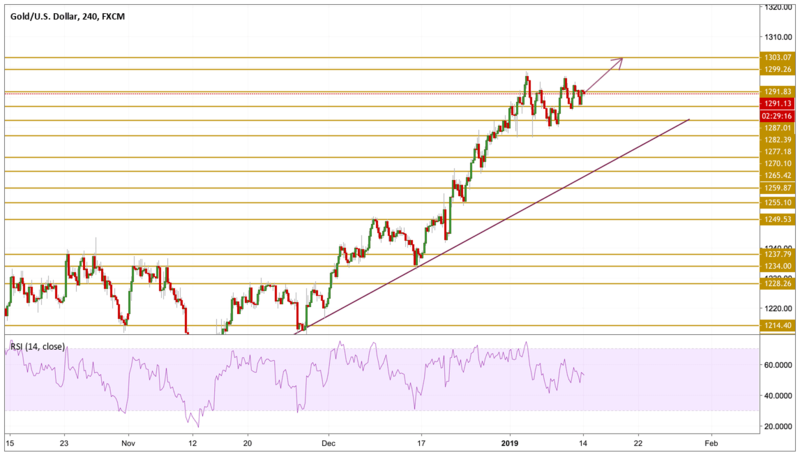 The XAU/USD pair came under strong bearish pressure in the early NA session on Friday and slumped to $1287 before finding support and going into a consolidation phase. Data from the US showed that the core CPI, which strips volatile energy and food prices, increased 2.2% on a yearly basis in December to match November's reading and market's expectations. With the data not offering any surprises, the Dollar's index stayed relatively quiet with a bias to the upside putting more pressure on the pair. However, with major equity indexes in the US having a hard time carrying the rally into a 6th day on Friday, the risk appetite weakened and helped the precious metal retrace its drop. Gold prices clearly entered a consolidation phase as the price action became limited between the $1285 level and previous tops. The price is currently holding above the $1290 level with a relatively bullish momentum. We expect a breakout soon to the upside once the price break and consolidated above the $1282 level so we will keep our previous target at $1302 per ounce in focus.